A ground breaking new series of animation has been released to expose the current flaws in our educational system and to highlight the better ways by which children can learn. Profound truths are often so unsettling that people lose themselves in lengthy explanations that ultimately confuse, rather than clarify. How humans learn, and consequently how children should be brought up, has long troubled our ancestors. Most of today’s schools are based on the assumption that children are born to be taught, rather than to learn. The findings from recent research have started to clarify the essential distinction between “learning” and “being taught”. With this better understanding (from the 1980s onwards) of how children actually learn we are able to see how their innate curiosity can all too easily be knocked out of them by insensitive schooling, unchallenging environments and poor emotional support. The 21st Century Learning Initiative is pledged to get ever more people to question their old assumptions in an essentially “play-like” manner, and so accept the truth of Einstein’s oft-quoted statement that “imagination is more important than knowledge.” That is why we are thrilled to be launching a series of short animations, narrated by the British actor Damian Lewis, which set out these ideas in an easy-to-understand and accessible way. The idea behind the animations, that we are “born to learn”, has massive implications for individuals and society. Firstly, it speaks to the intuitive understanding of people everywhere. It strengthens their innate feeling that there is a very direct relationship between how young children develop, and how they build confidence as adolescents to become more self-starting, responsible and collaborative members of society. At present there is a massive disconnect between how children and adolescents are helped into maturity, and this weakens both them as individuals and the whole of civil society. Secondly, in the earliest years, children learn incredibly quickly by following the example of people they admire. But the so-called “angst” of the teenage blues that follows is far from the problem that many imagine. Adolescence is now being seen to be that essential biological adaptation whereby the brain is forced to rebel against simply being told something, and consequently struggles (against parents and teachers) for the space to do it for itself. It is this which gives humanity its creative energy. 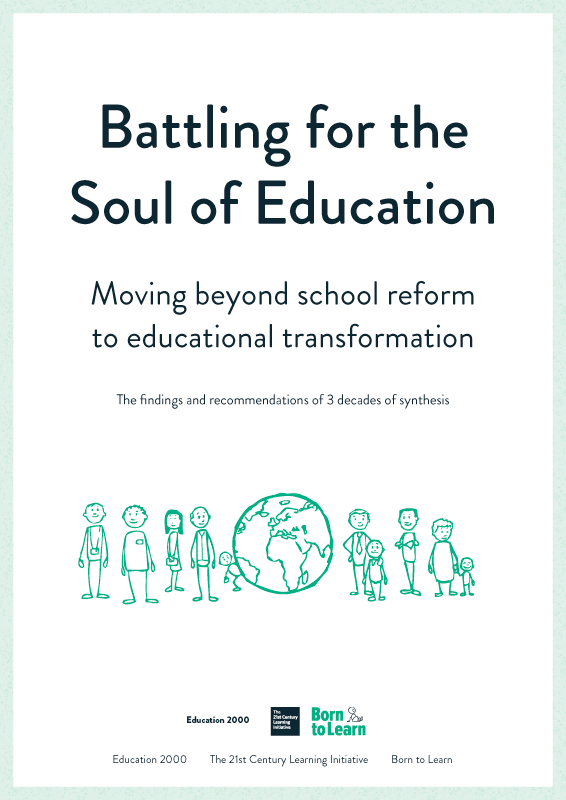 Critically, formal schooling has to start a dynamic process by which pupils are progressively weaned of their dependence upon teachers and institutions. Young people need to be given the confidence to manage their own learning by collaborating with colleagues as appropriate, and using a range of resources and learning opportunities. This should represent a unique opportunity to redirect the more generous resources currently assigned to older pupils thereby front-loading the system, creating the smallest teacher-pupil ratios when they are young, and replacing a form of education based on instruction to one that involves more experiential techniques. Thirdly, until society at large realises that the crisis of education is not so much due to the failure of teaching in the classroom as it is to the failure of the community at large to capture the imagination, involvement and active participation of its young people no reform process can succeed. No legislative provision by any government that is not fully understood and supported by the people will ever effectively reform an outdated school system. If the wrong model of learning is applied, even though apparently for the best of reasons, no country will ever get the results it seeks. These animations are a Call to Action. They are The Initiative’s contribution towards helping society get off its backside and do for the next generation what earlier generations did without question for their own young (in many cases this meant our own parents and grandparents). Too many opportunities have already been missed… and there is literally no time to waste. We have to mobilise all the energy and imagination that we can muster… AND JUST GET ON AND DO IT. Next: What’s a Serious Academic Doing Meddling with Animated Documentary Graphics?